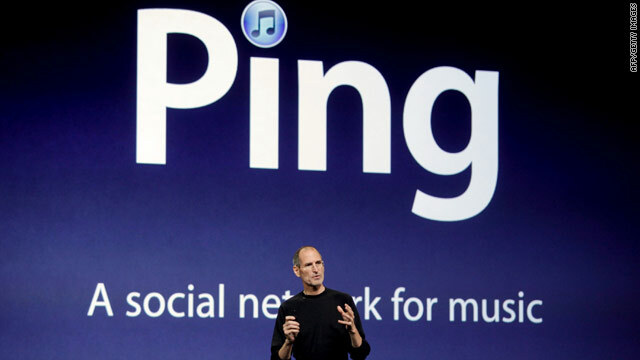 Apple's social network, called Ping, has teamed up with Twitter for sharing music recommendations. (CNN) -- One million people registered for Apple's music-centric social network in the first 48 hours it became available in September. But some evidence indicates that Ping may be having trouble keeping their attention. However, a collaboration between Twitter and Apple could open a backdoor to a part of the corporate workforce that has been locked out of Ping during the crucial daytime hours. With Ping -- the social service that lives within Apple's iTunes program -- users can now post links to songs and albums to their Twitter accounts. When you find such a message in the Twitter.com stream, you can click the tweet to see a box showing details about that song from iTunes, along with a button for listening to a short snippet of the track. Twitter announced the changes on Thursday. The Ping features -- available to users in the 23 countries where the iTunes Store sells music -- is an extension of Twitter's site overhaul last month that added a similar preview function for photos and video, a Twitter spokeswoman said. A stroll around dozens of profiles in iTunes just after the announcement reveals a less-than-vibrant place. In order to use Ping, you must first create an iTunes account, which requires a credit card. Apple says it has some 150 million credit cards on file, but that requirement still creates an obstacle for children who don't have credit cards of their own. Kids, aged 13 to 17, made up Facebook's fastest-growing demographic this summer, according to data from Inside Facebook, which tracks activity on the social network. Next, and here's what could be a major hindrance for office workers, you must have the iTunes software installed on your computer in order to use Ping. The program doesn't typically come packaged with corporate-issued machines. Companies frequently block workers from installing applications without prior approval. They do so because nearly two-thirds of all security vulnerabilities in software from Microsoft can be prevented by disallowing workers from installing programs, according to a report from security research firm BeyondTrust. But in many offices, Twitter and Facebook are just a few keystrokes away in a Web browser. The workday has proved to be prime time for Facebook, the world's most trafficked social network. About a quarter of workers in the U.S. and U.K. say they spend more than an hour on social networking sites during office hours, according to a recent survey. Seven percent of Web pages workers accessed recently were to Facebook, observed internet security firm Network Box. Ping widens its potential daytime audience thanks to the partnership with Twitter, which has 175 million registered users. But the integration is only a one-way street, a Twitter spokeswoman said. Tweets cannot be fed into Ping.